Hello! Mr. Blog? Can You Hear Me? I got a Kindle for Christmas last year and have been cramming it full of books (I pondered cramming it with tasty treats, but opted to stuff them under the bed. Shh!) ever since. I looked at my list of books and I have three or four fiction books, a couple memoirs and the rest is all reference books on writing, blogging, craft.. yadda yadda. This brings me to Kristen Lamb. I wrote a super short review on her book, We Are Not Alone – The Writer’s Guide To Social Media. The book helped me immensely! I was completely clueless when I started taking my writing seriously. I was all over the place not knowing what to write about. This blog you are reading now was actually going to be a blog filled with daily meditations, hence the url the daily woman LAME! Anyway, I am off topic. 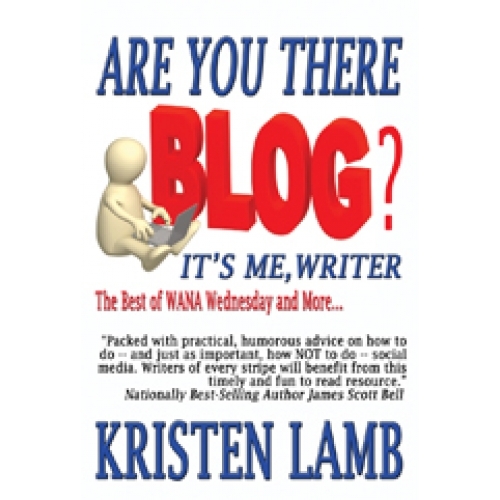 If you really (and I mean really) want to get on a good track as far as blogging, building author platform and not being laughed out of the writing village.. then you owe it to yourself to get Kristen’s other book Are You There Blog? It’s Me Writer. I am reading it now and I am learning so much stuff to do, but more importantly, all the stuff not to do. I know it is odd to recommend a book before even finishing reading it. But I can safely say, based on her other epically epic book that I did finish, that this one is a keeper as well. I actually just put it down a moment ago so I could let everyone know how great it is before I get caught up in something selfish. Oh! Almost forgot.. I found Kristen Lamb right here on WordPress. So go on over and check out her WordPress blog by clicking here. She has Twitter Tuesday which is my favorite and a whole lot of other fun stuff. Yes, she gives us all crap from time to time but she makes it so darn funny that those of us who read her blog just don’t care. OMG…you totally gave me tears. THANK YOU! I have had a really rough week, and this was just the pick-me-up I needed. My pleasure, Kristen… you have helped me in a lot of ways. I felt I needed to show some love! Me too! 😀 I am so happy I found her and thereby found all of my wonderful writing buds because of her.